Distribution and habitat: Sarracenia psittacina is a carnivorous plant native to North America. It is found in the wetter parts of boggy areas in the coastal plain from southern Georgia and northern Florida to southern Mississippi. 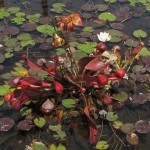 Quite often the plants can be found near the waterline. They may occasionally be submerged. While submerged, it will capture water arthropods and tadpoles. Sarracenia psittacina employs an unusual trapping mechanism using a small entrance in the pitcher mouth which prey goes through in search of more nectar that was produced by the plant on the rim of the pitcher mouth. The prey is then confused by light shining through what appear to be false exits and crawls toward the brighter area down into the pitcher. Crisscrossed downward-facing hairs densely line the interior of the pitcher, forcing the prey further into the pitcher to an area where digestive enzymes such as proteases are prevalent in the liquid. Description: Sarracenia psittacina is a small plant that usually keeps its pitchers (the plant’s leaves) tightly against the ground in a flat, prostrate rosette with semi-erect habit. The leaves are like narrow tubes with a prominent wing on the side facing the center of the plant. A mature leaf of Sarracenia psittacina often has a conspicuously red-purple hood with the tubular part of the leaf greener closer to the ground. The opening of the hood faces downward. The younger leaves show that the wing develops early, but the hood increases in size later, as the leaf matures. Therefore, the younger leaves cannot trap insects. The entire plant is brightly pigmented to attract prey, but not all leaves of Sarracenia psittacina are bright red-purple. Some of them are somewhat greener and show the mouth of the hood close to the top of the wing. The veining on the hood is purple and green. There are numerous patches that are translucent, transmitting the sunlight into the interior of the hood. The tubular part of the pitcher gets narrower and crisscrossed with dense downwardly-pointing hairs. This means that if the prey tries to fly upward in the narrow tube, it is more and more likely to hit the side, rather that get back up into the hood. The hairs keep pointing it farther and farther down, to the pool of liquid at the bottom, where it drowns and is digested by the plant. Sarracenia psittacina are long-lived plants. When the plant reaches maturity—about three or four years of age—a very beautiful, strange reddish pink bloom on a tall stalk will erupt from the rosette of pitchers in early summer. The display is quite spectacular. The flowers of this Sarracencia psittacina are red and have a very special structure. They open downward. Very likely, an insect would be attracted by the big white center area (the back side of the stigma) surrounded by the red-purple petals. There is white, which an insect would tend to follow, at the base of each petal. To get in, an insect has to crawl around the down-turning edge of the stigma, which it does by pushing back the re-curving portion of the petal (white zigzag part of the petal, at right). This trap-like mechanism tends to keep it inside the flower for a longer time, to increase the chances that it will pick up the pollen grains from the stamens (yellow) or deposit some of the pollen grains on the umbrella-shaped stigma. 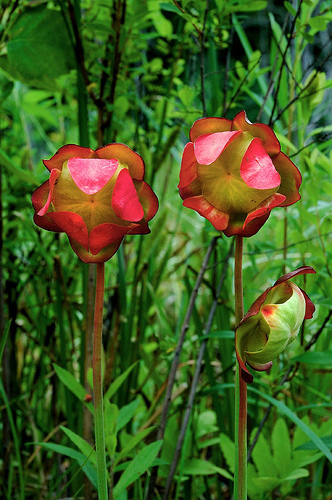 Sarracenia psittacina flowera are not only among the most beautiful in nature, but cleverly designed to enhance cross-pollination. Insects carrying pollen from a previous flower can enter only over the female stigmas between the petals, where the pollen is deposited. Once inside, they becomes dusted with fresh pollen. To exit, they push through the petals, thus avoiding the stigmas and self-pollination. When the flower open, they will remain in petal for seven to ten days on average. Houseplant care: Prune dead stalks at any time. While Sarracenia psittacina go dormant its pitchers will look pretty decomposed by late winter and can be removed to make room for the early spring’s growth. Light: The Sarracencia psittacina enjoys being in a bright light spot. Sunny south-facing decks, porches or windowsills are perfect for them. Temperature: The temperature for this species should be between 5°C (41°F) and 30°C (86°F). For lower temperature the plant must be taken inside in winter. So not mist spray this plants. Sarracenia psittacina pot will always stand in water, therefor the high humidity around plant will be given by water evaporation. Sarracenia psittacina require a period of dormancy in order to stay healthy. It requires 3-4 months of winter dormancy triggered by cold temperatures (below 10°C (50°F) ) and shorter daylight hours. Water: Sarracenia psittacina likes a moist potting mix. Indoors the container of the Sarracencia psittacina should therefore always be placed on a bed of water. Use distilled water, rainwater or water collected from condensation, like from an air conditioner. Even while dormant, the plant will still need to stand in water to prevent its soil from drying out. 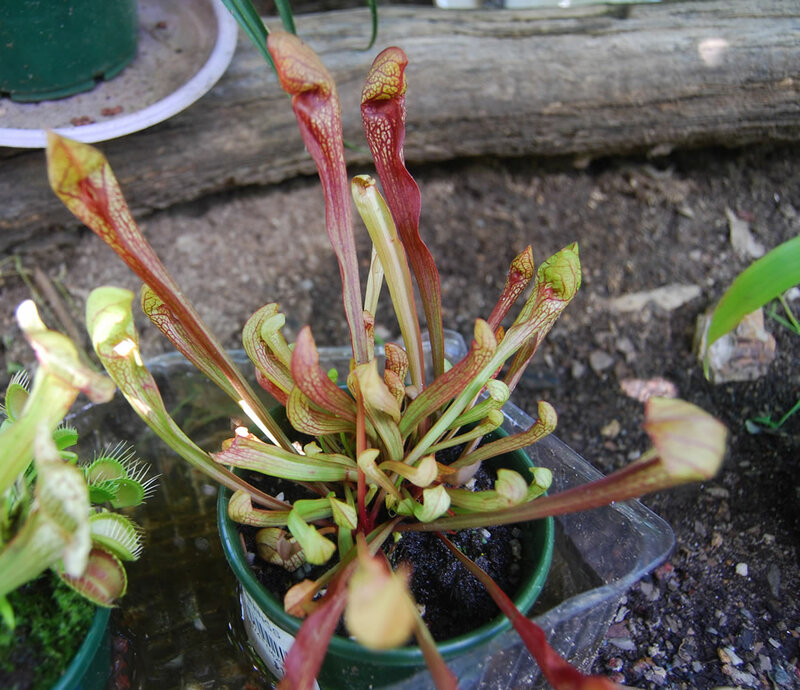 Feeding: No feeding is necessary for Sarracenia psittacina. Also, it is not necessary to feed insects to the plant for its growth. However, where the insects are scarce, such as in a greenhouse, a foliar fertiliser applied once or twice monthly during the growing season will help accelerating the growth. Potting and repotting: The soil for the Sarracencia psittacina, just as for all the other carnivorous plants, should be poor in nutrients. Uses a mix of peat, sand and perlite. Repotting is needed every two years. Use a tall non-draining container: plastic and glazed ceramic are excellent, not cement, concrete nor terracotta pots as the minerals will kill the plants. By using a tall pot will easily accommodate the rhizome and its long root system. Sarracenia psittacina tend to grow faster and larger when their roots have room to grow. Large pots will also give your plants added protection during the winter. If necessary, move the plant in one size larger pot. Repot during late winter and early spring for a robust plants in summer. Changing the potting mixture restores soil acidity, improves root aeration and strengthens the health of your plants. 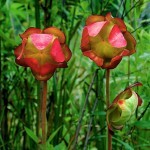 Gardening: Sarracenia psittacina are among the best plants for bog gardens. Older Sarracenia psittacina turn brown from the top down; trim off the dead parts, but insect filled leaves that are still healthy will continue to feed the plant. Usually all remaining pitchers will look pretty decomposed by late winter and can be removed before or during early spring’s growth. Position: In the garden a spot on the edge of a pond is ideal for Sarracenia psittacina. Make sure the bog garden is situated in a sunny area. Bog plants need lots of sun. Place Sarracenia psittacina in an area that will get at least six to eight hours of direct summer sunlight each day in summer. The colouration of this plant can be mostly green when shaded by low-growing vegetation or with much red venation when grown in full sun. 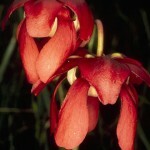 Soil: Use one-to-one mix of peat and sand to prepare the right soil for planting Sarracenia psittacina. Placing a layer of long-grain sphagnum moss over the soil mix is optional but will help to retain the moisture of soil, which is crucial for the wellbeing. Irrigation: Sarracenia psittacina likes boggy, humid environments, so make sure their soil remains constantly moist. 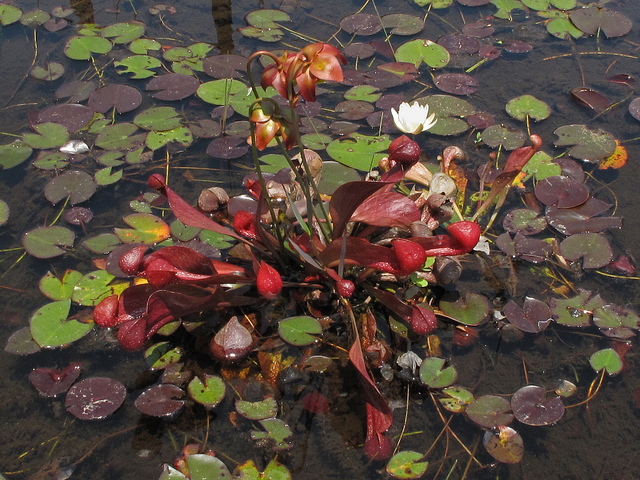 Plants are able to spend their winter dormancy in an outdoor bog garden. In freezing climates this plant should be mulched to add some protection. 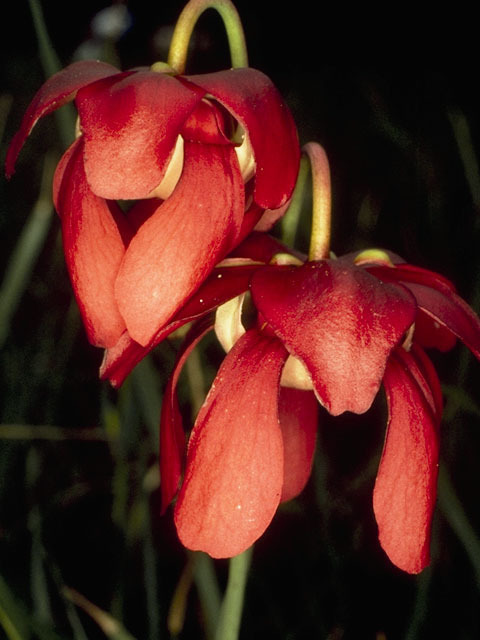 Fertilising: No fertilizer is necessary for Sarracenia psittacina; in fact, doing so might kill them, as they are accustomed to nutrient-poor soil. Carnivorous plants have adapted to capturing insects on their own and insects will naturally be attracted to this plant. If you choose to feed your plant, use recently killed insects. Do not feed your plant meat. Feeding is not at all required during the winter months when the plant is dormant. Propagation: Sarracenia psittacina can be propagated by seed. The seedpod will turn brown and gradually crack open by autumn. The seed, up to several hundred, can be collected at this time. Each seed is brown to reddish tan and about the size of a large pinhead. Separate the seeds from the ovary and store dry seed. Always store seed in the refrigerator. To germinate, the seed needs several weeks of chilly, damp stratification. It is usually best to sow the seeds in the middle of the winter. Do not bury the seed. Sow sparsely and treat with fungicide if any hint of damping-off or botrytis disease. Light frost is helpful during stratification. After stratification, with warmer, pertly sunny conditions, the seed will germinate. At the end of the growing season, the seedlings will have pitchers 2.5 to 5cm (1-2 inch) tall. The plants will take, on average, about five years to reach maturity. Baby plants can achieve maturity in as short time as three or four years with fertilisation. Sarracenia psittacina are slow at producing offshoots and new growing points or they will never multiply. However, sometimes potted specimens should be divided and transplanted every three to five years or when the growing points become crammed along the edge of the pot. This should be done only during dormancy or early spring growth. Rermove the plant from its pot and wash away as much soil as possible. The growing points from which the pitchers emerge are clearly separated. The rhizome is often gnarled and branching, the roots tough and wiry. Separate the growing points making sure that each growing point has roots and plant them in different pots. After dividing a mature rhizomes it is best to be cut off any emerging flower buds so the plant can put its energy into healing and plant growth. Primary pests of Sarracenia psittacina are aphids, scale, thrips and mealybugs. Treatment: Use an appropriate insecticide. Treatment may need to be repeated with annoying pests like mealybug, which can be spread by ants. After treatment, cut off any badly deformed emerging pitchers so the plant can put its energy into growing new, healthy leaves. Seeds can be attacked by damping-off fungus. Treatment: Treat the plant with an appropriate fungicide. Uses: Sarracenia psittacina make excellent windowsill plants and are also able to live outdoors year-round in bog gardens.